Take a walk along Redwood Creek on a sunny afternoon after weeks of winter rain. The air is saturated with the smells of damp earth, bay laurel, and decay. Hidden in the trees, warblers trill their high notes, and in the distance a kingfisher rattles. Mostly, though, it is the water that mesmerizes. There is something primordial about a living stream, the clear water rushing over boulders and beneath fallen logs, succumbing to gravity's inescapable demand to head from the hills to the sea. People are enthralled by flowing water even when they don't understand its power, and perhaps in their visceral response they know creeks are something essential. For creeks nurture life and shape our landscape to a degree many never have considered. 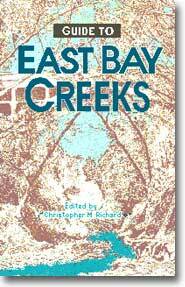 The entire area we call the flatlands, where we have built the cities of Richmond, Berkeley, and Oakland, was created by creeks carrying soil down from the hills. And the creeks create rich habitats where wildlife thrives, from freshwater fish to birds and mammals that depend upon streamside vegetation. But because people have dimmed their awareness that streams are essential arteries of the terrain, they have treated them badly, causing widespread erosion, floods, and habitat destruction. People are unaware that disturbing a stream has impacts upstream as well as downstream, and that almost anything dumped on the ground anywhere eventually makes its way into this living system,moving into the creeks and ultimately into San Francisco Bay. Increasingly, however, people are struggling to bring our waterways back to health. In Richmond local activists stopped a plan to channelize Wildcat Creek. In Oakland an ethnically diverse neighborhood is cleaning up Courtland Creek. Throughout the East Bay city dwellers are recognizing that even in urban areas we have wildlands valuable to humans and other animals. These people are learning ecological relationships through direct experience, and they are hoping that ultimately there may be an attitude shift, a cultural recognition that even city dwellers are an integral part of a living system.